Many people are familiar with tuna and it is served in various ways: canned, cooked or fresh, such as in sushi. The most well-known types are the bluefin and yellowfin tuna. When they are caught, though, it is hard to tell these two apart since they usually lose their color after a long struggle. How then can we tell the difference between the bluefin and the yellowfin tuna? Continue reading and we’ll provide you with the information that set these two apart. There are four species of bluefin tuna, namely: Thunnus maccoyii, Thunnus orientalis, Thunnus thynnus, and Thunnus tonggol. Bluefin tuna are the biggest type of tuna. They can grow to over 3 meters in length and around 1,000 pounds in weight. Bluefin tuna are warm-blooded and can swim extremely fast. They can accelerate faster than the average sports car. The bluefin tuna live in colder climates. Characteristic of the bluefin is its blue streak just below the upper portion of its body, dark blue tail, and short pectoral fins. Bluefin tuna are usually caught in the deep sea. This is the type of tuna which has the most amount of fat in its meat. Most species of the bluefin tuna are already classified as endangered due to the effects of overfishing. This is largely due to the growing demand of sushi all over the world. The meat of the bluefin tuna is considered the most expensive in the market. A type of sushi called Otoro is a highly desired part of the tuna belly. It is the part of the bluefin tuna with the most fat and comes at an incredibly high price. Yellowfin tuna or Thunnus albacares is a species of tuna commonly found in the warm ocean waters. They are a widespread type of tuna. Yellowfin tuna are warm-blooded and really fast swimmers. They can grow to over 2 meters in length and 400 pounds in weight. The yellowfin tuna has a yellow color streak in the mid part of its body. This tuna has a long pectoral fin and yellow second dorsal fin. Its tail is a mix of yellow and gray. 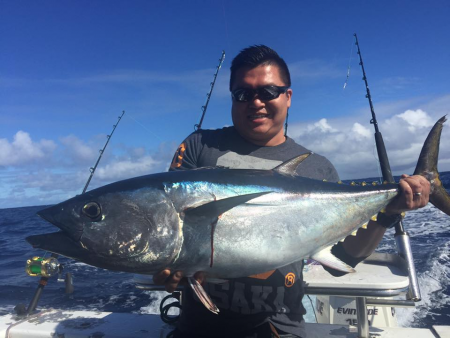 Yellowfin tuna are caught in the open sea and usually at drop-offs. They have very lean meat and are considered relatively cheaper when sold in the market compared to the bluefin. 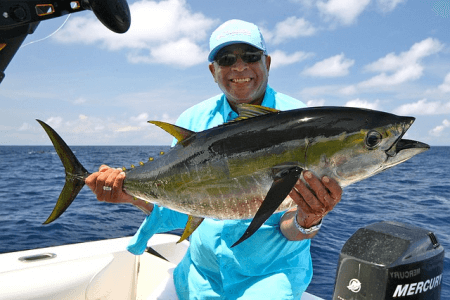 What is the difference between bluefin tuna and yellowfin tuna? The bluefin tuna is the biggest among all the species of tuna. However, its pectoral fin is shorter than that of the yellowfin tuna, whose pectoral fin reaches slightly beyond the second dorsal fin. The bluefin tuna has blue hues on its body and a dark blue tail. The yellowfin tuna, on the other hand, has a yellow streak on its body and its tail color is a mix of yellow and gray. They are both warm-blooded but the bluefins live in colder climates whereas yellowfins thrive in warm ocean waters. Bluefin tuna are usually caught in the deep sea compared to yellowfin tuna, which are more abundant in the open sea and also near drop-off areas. Bluefin tuna is more expensive since it contains a large amount of fat in its meat. The yellowfin tuna has very lean meat and is priced cheaper than the bluefin.